Saturday, November 8, 1913: Nothing much to write. Since Grandma didn’t write much a hundred years ago today, I’ll share a fun advertisement I came across. Posted on November 8, 2013 November 8, 2013 by SherylPosted in AdvertisementsTagged 1913, family history, genealogy. Wow – can you imagine what one of those is worth now?? I’m also struck by how much it cost then versus what it would cost now. I love looking at old advertisements. My grandfather’s younger brother was named Theodore Roosevelt Burr. Uncle Ted let me know that both he and Teddy Bears were named after the president! My dad (b. 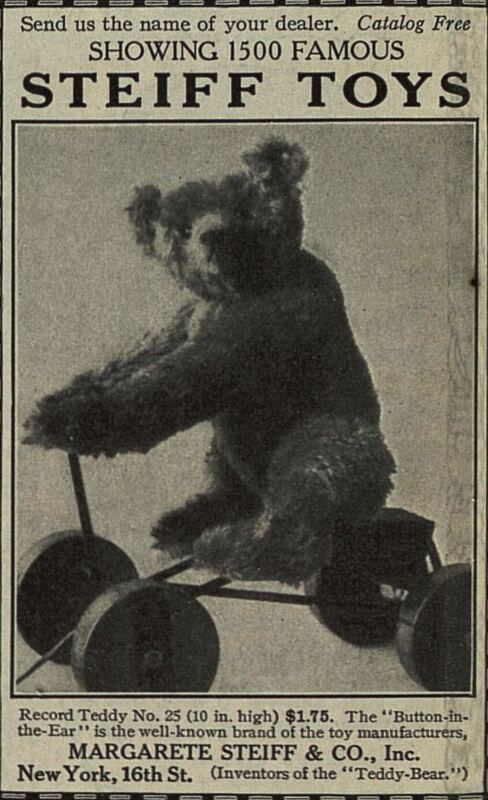 1924) had a teddy bear that looked like that. It’s around somewhere… I should find it, photograph it, and share it on my blog. I think the bear on the bike is so cute. That is a cute advertisement. I am trying to think if I have seen a modern day advertisement for a Teddy Bear; it’s possible that they have become so popular that there isn’t any need to advertise them??? Do you know the story of Margarete Steiff? It’s such a lovely story.